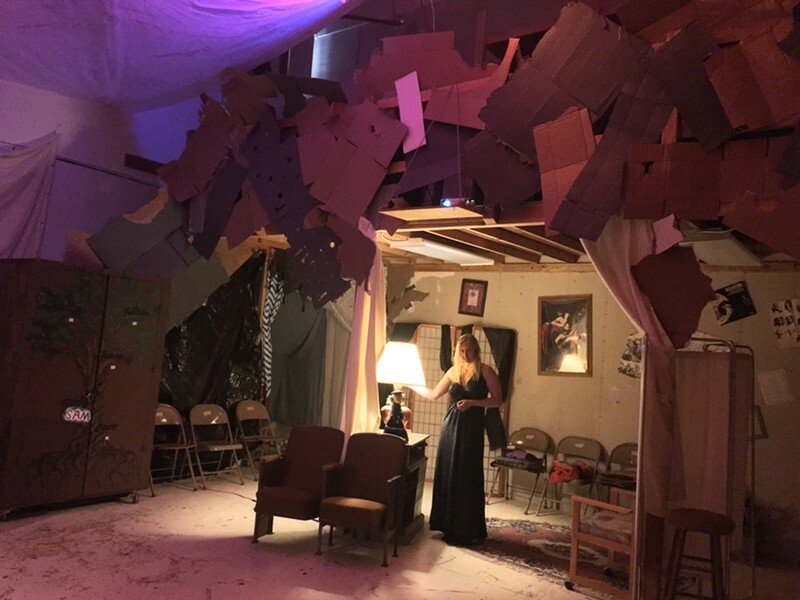 Actor Linnea Ytterlid on the immersive set of Let Me Out! at Dell'Arte. Let Me Out! explores what happens when theater meets role-playing game meets escape room, wrapped up in a murder-mystery evening that may or may not be trapped in an endless repeating cycle. The outcome of a year of research and development by Dell’Arte graduates Eric William Jones, Marguerite Boissonault and Linnea Ytterlid, Let Me Out is totally immersive theatre, playing for only two more performances, Saturday, May 26 and Sunday May, 27 at Dell’Arte’s Taylor Way building in Blue Lake. And it is mesmerizing. Audience size for Let Me Out! is very limited, maybe 15 people max, and for good reason — because everyone has a part to play. 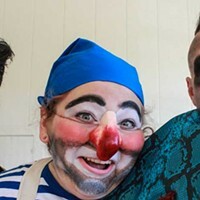 Of that audience (in the language of the production, “witnesses”), six are chosen as “players” to participate fully as defined characters in the production. These players are led off to be briefed by the three creators, who are also players, shortly before the action begins. Meanwhile we remaining witnesses are led into the performance area. Here, we are invited to select our seats from among the random chairs scattered around the “room,” which has the feel of a long-abandoned part a long-abandoned house; all the walls are covered with broken-down cardboard boxes and a large cabinet sits in the middle of the floor. At first, all we hear is dirge-like music. Then we become conscious of people walking about. Dana, the central character (Marguerite Boissonault), approaches and opens the cabinet, ushers a second woman (Linnea Ytterlid) inside and locks her in. Dana lies on the floor and the lights go out. The remaining players enter, led by Gary (Eric William Jones) and guided by a flashlight, as a giant digital clock projected onto the wall starts counting down. Suddenly lights begin to flash, strange and disturbing sounds fill the space, and Dana begins to rise, as if awakened from a dream. Everyone has a strange feeling they have been in this place before. They feel that they know each other but do not (yet) know how or why. As they explore their surroundings, each player begins to uncover pieces of his or her past (“hey, we must be married!” “I was a manager at Target!”), but there is no sense of time having passed. Dana waits for someone to recognize her and tell her who she is. A panicked cry emerges from the cabinet. The players must figure out what combination of letters will open the lock (which they eventually do), and the woman, who goes by Sylvia, staggers out, crying that she has no idea how long she’s been trapped. Then Gary pulls a large, rusted object from the cabinet, which sets in motion the life stories and relationships of all the characters, as they gradually unfold before us. But when we pause, do we finally die? Or do we begin the dream again? And again? And again? Let Me Out! Is an extraordinary experience and one that I hope will continue to live, evolve and expand to allow many more people the privilege of entering its alternate(?) reality.